The work to achieve a climate and energy bill in the United States is moving with considerably slower momentum this spring than it did at the same time last year. A number of factors contribute, not the least of which is the time and focus that the White House and Democrats in Congress devoted to enacting a national health care bill, which passed earlier this month. Another factor is the flagging U.S. economy and the meager appetite that many voters and lawmakers have for big new domestic initiatives, like the proposed climate and clean energy bill. Still, the wearying health debate and the Great Recession do not fully explain the uphill struggle of climate activism. Another factor is at work. After years of swinging away at the climate action community’s formidable message of urgency and useful solutions, the fossil fuel industry’s rhetorical axes nearly four months ago found a soft spot in the scientific details of climate change. The climate action community’s response has been double-barrelled. In December when the email conversations of climate scientists were stolen from East Anglia University, climate activists made a good case that nothing said between researchers damaged the foundations of the global consensus on the causes of climate change, its urgent consequences, and the opportunity for solutions that generated new industries and new jobs. The second response has been to penetrate and uncover the full range, influence, structure, and interlocking relationships of the fossil fuel political infrastructure, which is actively involved in fostering the campaign of scientific deceit. The results of that work have emerged in the last couple of weeks. Last week Greenpeace International published “Dealing in Doubt: The Climate Denial Industry and Climate Science,” which documented the 20-year campaign led by ExxonMobil to exploit the space the mainstream media opened with its “let’s hear from the other side” principle of reporting. Meanwhile in Europe, Danish newspapers picked up the story initially flagged by Pete Altman, a climate specialist and blogger at NRDC, who reported that a Danish study critical of Danish wind energy was financed by an American activist think tank with financial ties to oil-rich Koch Industries. This week Greenpeace advanced the story enormously with its new report, “Koch Industries: Secretly Funding The Climate Denial Machine.” The report makes clear that Koch Industries is, and has been for over a decade, a stalwart institution, financier, and strategic adviser for the fossil fuel industry’s political infrastructure aimed at one outcome: Blocking the advent of the low-carbon 21st century economy and wrapping its arms as snugly as it can around the 20th century drive-through, energy wasting, coal-gas-oil-fueled American way of life. The Greenpeace report also describes how Koch Industries, with revenues of $100 billion annually, 70,000 employees, and operations in 60 countries can execute this goal with a shockingly low investment. 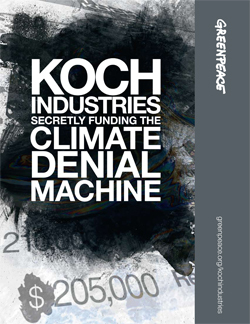 The report identifies over 40 climate denial organizations that Koch funded from 1997 to 2008 for $50 million, roughly half of that from 2005 to 2008. In addition, Koch Industries spent less than $6 million since 2004 on the campaigns of federal lawmakers, almost all Republicans, and $37.9 million from 2006 to 2009 for direct lobbying. In other words for an investment of less than $10 million annually in the lawmakers, lobbyists, activist think tanks, communications shops, and other facets of the political infrastructure, Koch Industries has assured the rising revenues and profitability of its core climate changing businesses. Koch and its sister companies in the fossil fuel industry are so wealthy they can devote a tiny portion of their total revenue – a fraction of a fraction of 1 percent – to finance an influential inter-connected political infrastructure at the state level and in Washington. The extent and expanse of that investment reveals the tight coordination that the fossil fuel industry deploys in executing its progress-denying work. Along with some of the usual suspects expected to receive Koch money — American Enterprise Institute, Cato, Heritage, Reason — the company also finances some of the active and influential state-based groups committed to “sound” science that is anything but. The Mackinac Center for Public Policy in Michigan, for instance, whose staff includes a former libertarian anti-science state director of the Michigan Department of Environmental Quality now dedicated to clouding the science of climate in Lansing, the state capital. And the Heartland Institute in Chicago, a free market “think” tank that isn’t doing much thinking about climate action that right thinking people would generally consider valuable. More on this and other investigations as we move forward.